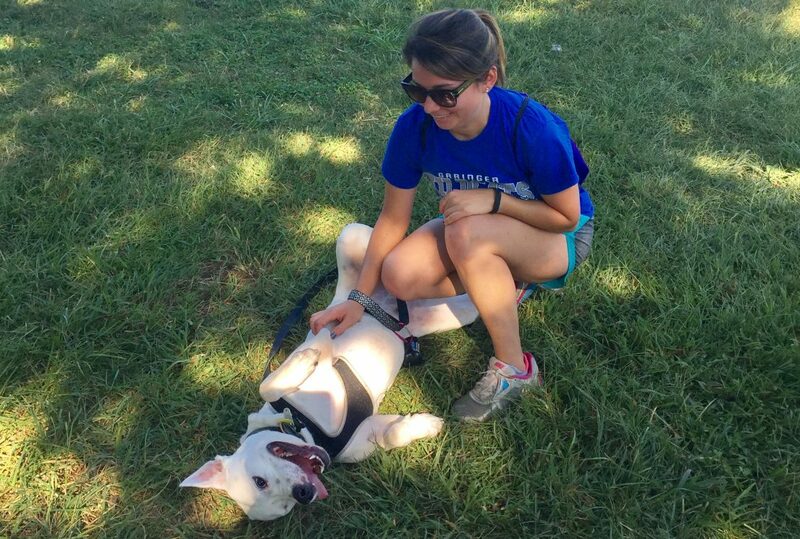 When we saw Ruxin on social media, we knew we had to learn more about his adoption story. 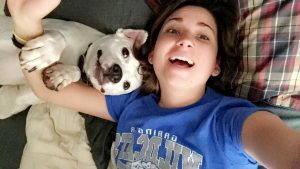 Lucky for us, his owner Katlyn was eager to share everything: his Gotcha Day, how he has changed their lives, and advice for rescuing a pet. Read on to see the interview. 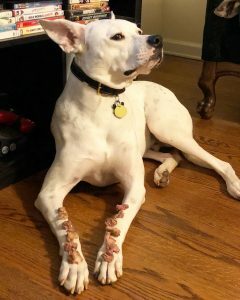 Can you tell us more about Ruxin’s adoption story? My boyfriend and I had talked about getting a dog for a while and the two weeks before getting Ruxin we were talking more seriously about it. We were constantly looking at shelter websites and hoped we would see one that caught our eye. One night we were sending each other dog pictures from the Humane Society and fell in love with one of the dogs. We were so excited and decided the next day we would go get him! His name was Spot. That morning I woke up excited and could not stop talking about the dog we were about to get. I was crushed when my boyfriend confessed he did not think it was a good idea. A dog was a lot of responsibility, money, and time. I understood, but was very upset and sat quietly in bed. 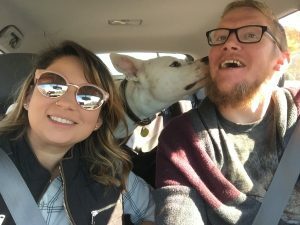 A little while later, my boyfriend came in and said, “Let’s go!” In the car, we both agreed that if Spot was not there that we were going to leave. We would not look at other dogs. 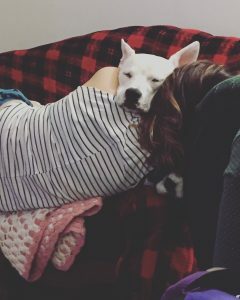 We walked into the shelter and requested the cute black and white dog, Spot, only to find that he was on a sleep over with a potential adopter. We were bummed, but looked at each other and quickly agreed we would still walk around and look at the other dogs. This was a very overwhelming experience. There were rows and rows of dogs. After we walked past them all we were told we could choose ones to go play in the yard with. We continued to walk while passing dogs that were jumping, howling, and licking excitedly. We passed by a crate that had a sweet white dog that sat patiently at the gate and politely wagged his tail. When we put our hands against his cage, he gently licked our hands while sitting sweetly. We decided we would play with this dog first. We waited in the yard until they let out our soon to be dog. He immediately ran up to us and licked us everywhere. I do not know if I have ever seen a dog so excited. He took turns giving love to each of us. We were asked if we would like to play with another dog, but we knew he was the one. Before we left we talked to the Humane Society to learn more about his story. Every month or so they take trips to kill shelters and save the dogs that are close to their kill date. The Humane Society of Cabarrus County in NC saved our boy the day he was supposed to be put down. I do not think I have ever been more grateful towards a company. Without them, I would not have the companion I have today. The first weeks with Ruxin were very emotional. We could see all of this sweet boy’s ribs. He was very underweight and had kennel cough. The first week we had him he would have coughing fits every time he got excited. It was heartbreaking, but at the same time, I never knew I could love something so much, so quickly. The Humane Society said they believed he was 1-2 years old, which was exactly what we were looking for. We absolutely did not want a puppy, so we were excited to have a dog that was out of the puppy stage. As time went on and we saw vets, we realized this pooch could not be more than 7 months old. Even though he had full on puppy energy that we were not prepared for, we are happy we got to spend these early months with our sweet boy. Ruxin was and still is the most loving dog I have ever met. He loves every person he meets. He has a bubbly personality and is always eager to please. He has gone through puppy, intermediate, and is currently in advanced training. He has learned so much and progressed in ways I never thought possible. We plan to continue his training so that he can be a therapy dog. I know his loving demeanor and spunky personality will change lives. Even his trainer has said that he is the happiest dog she has ever met. These 10 months have been so incredible. 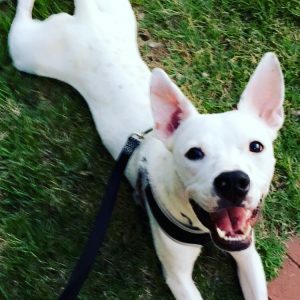 I encourage anyone who is interested in getting a dog to go to their local Humane Society. Feel free to follow Ruxin’s Instagram: the_reign_of_ruxin to follow all of his adventures! What was it about Ruxin that let you know he was the one? Walking through the crates of dogs was honestly very overwhelming. There were so many dogs and it made our hearts hurt to not be able to take all of them home. As I said above, the way he sat sweetly and gently licked our hands is what made us choose to play with him and see if he was the one. During our playtime in the yard, the only thing he cared about was us. He would have sat there licking our faces all day if we let him. He was so excited and so sweet. I know it is cliché, but we just knew he was the one. There were times that we discussed that we thought it may have been because he was the first dog we played with. We thought that it may have been to hard to meet one and then choose to play with another. A couple months ago, we discovered this theory was wrong. We actually went to the Humane Society to get Ruxin a brother. We played with 3 different dogs and none of them felt right. I hate that we weren’t able to save another dog that day, but it showed us that Ruxin truly was the one. How has adopting Ruxin changed your life? Adopting Ruxin has completely changed our lives. In the beginning it was more in ways of gained responsibilities. My boyfriend and I both were still in college mode, where we stay up late and slept in. Once we got Rux, our lifestyles changed. We had to wake up early and this dog’s life was in our hands. I am not going to lie, this was a hard adjustment for us, but as time went on it got easier and we would not change one thing about our lives now. Responsibilities aside, Ruxin has made our lives so full. He is way more than our pet. We miss him when we are gone and are just as excited to see him when we get home as he is us. I never thought I could love something as much as I love this dog. Something else amazing that has made this experience so great, is seeing how much he has grown in his training. In the first months we had him, I got nervous every time we would take him out in the community. He did not walk well on a leash and had a pretty bad jumping problem. We knew we were going to do puppy training with him, but had no idea that we would continue training classes as long as we have. If you saw him now, you wouldn’t even believe that he used to have these behavior issues. Going to training and learning how to teach him these things has been indescribable. Overall, there are no words to describe what loving a dog can do to your life. If I have a terrible day, seeing him and loving him can turn any bad day around. As I sit here writing this, his head is laid across my lap. He makes tedious household chores more bearable just because of his company. What are some of Ruxin’s favorite activities? Ruxin loves PEOPLE PEOPLE PEOPLE. Any chance he gets to meet someone new is the best day ever for him. He loves walks, especially at the park. He loves playing Frisbee and fetch in the yard. He has an abundance of toys but prefers to chew them while he is laying on you. He loves laying upside down on the couch and we have even caught him watching TV intently. Why do you advocate “adopt don’t shop”? “Adopt don’t shop” is something I feel very strongly about. Before getting Ruxin, I knew it was important, but did not care about it in the way I do now. My boyfriend and I both had discussed our favorite breeds and even though we had those desires, we knew we would always adopt instead. Seeing how many dogs were in one shelter alone is reason enough to adopt. In this tiny facility there were over 50 dogs waiting for their homes. I have also seen horrible stories about breeders and how abusive they can be to the dogs. Seeing how loving and wonderful Ruxin is and knowing that he was less than a day away from being put down breaks my heart. How many dogs have been put down because they were not adopted? There are many dogs that I know that came from breeders. 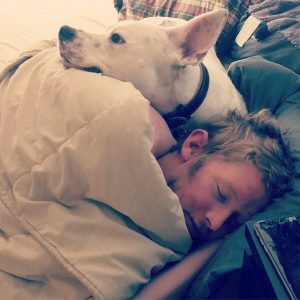 I love these dogs and their owners are really great. But seeing how wonderful the owners are with these dogs make me wonder how many shelter dogs could have owners as wonderful as these, but do not because they shop around instead. Another reason I advocate adopting your dog is because of the dedication the Humane Society makes for the dogs. 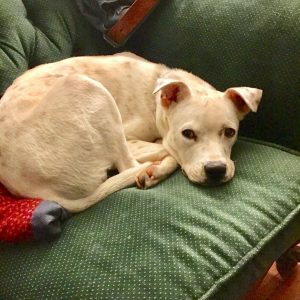 When we filled out the paper work, they made it clear that if it wasn’t a good fit that we would return the dog to the Humane Society instead of putting an ad on craigslist. This shows that this organization truly cares about what happens to these dogs. They take time to make sure these dogs go to safe homes. They also make sure that all of the dogs get neutered/spayed as well as treat them for any medical care they may need. 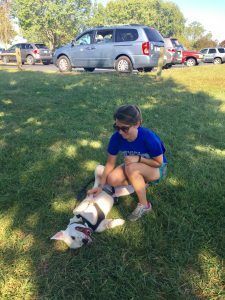 Adopting a dog that was extremely underweight with behavior issues and watching him grow healthy and into a wonderful dog was life changing. Once you have done this, it makes it so much easier to advocate “adopt don’t shop” I highly recommend any person who is interested in getting a pet to adopt. I promise you, it will change your life. What would be some advice you would give to those looking to adopt a pet? Adopting a pet is a very big commitment. It is important to really think about the decision and how much it will change your routine and life. So many shelter dogs get returned or put out on the street because they did not think the responsibility through. If you are not sure yet if you are ready, try fostering dogs! Fosters are just as important to shelter as it is to get adopted. This would be a great way to help out the shelter while figuring out if you and your family are ready for this commitment. I would also recommend adopting a dog based on dog personality and not by looks. It may be so easy to pick a dog that looks cute but they may not be the best fit for your home. Similarly, I think it is important to look around at all the dogs, not just the puppies. There are so many older dogs that live the end of their lives in the shelter and its heartbreaking. Some other advice I would give is to go through training classes with your dog. 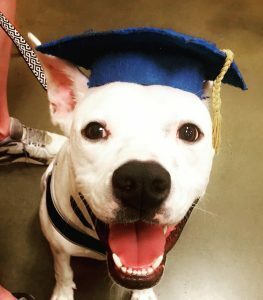 Going through these classes will bring you closer to your dog, while they learn so many amazing things. It is definitely the best money we have ever spent. What stereotypes would you like to shatter about rescue pets? I hope that people can put aside any stereotypes they may think about shelter dogs. Go in with a positive attitude and think about how much good you are doing by saving one of these dogs. A lot of the dogs may be timid or scared, but they will grow with your help! If your new shelter dog has a frustrating behavior, just remember it is probably because they went through something traumatic. For example: Ruxin HATES baths. Every month when we have to bathe him it is hard for us and him. It is easy to get frustrated with him. When we get this way we think about why he is like this. He used to live on the streets, where I am sure he spent too many nights outside during a storm. The bath may cause him to think about this bad times. Instead of getting frustrated with your dog during these times, just love them. Help your dog be the best dog he can be. Any behavior that they may have can easily be changed with training and will help you grow closer to each other. A big stereotype that we have had to deal with regularly, is the fact that Ruxin is a pit bull. Many people will openly express to us that they are scared of him or do not want to pet him because he is a pit bull. This upsets me so much. Pit bull’s are judged so hard and there is absolutely no reason they should be. If they are raised in a loving household they will be the best pet you will ever have. 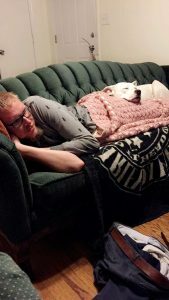 Pit Bull’s love people so much! They just want to cover you with kisses. 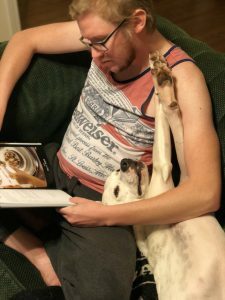 Many dogs in shelters are pit bulls and I think many reasons they do not get adopted is because people are uneducated about them or swayed by the pit bull stereotype. 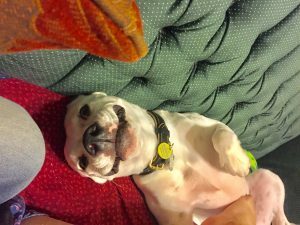 There are many things Ruxin does because he is a rescue pet. He strives to please us. During training, he works so hard and not only is it for treats, but because he wants to make us proud. When we go on walks he always shows how thankful he is that we did this with him. He takes time out of everything he does to come to us and show us love because of how appreciative he is. This is something that you will only experience if you adopt a dog. I love this story!! Please adopt, don’t shop. If my husband and I get another dog, it will definitely be a rescue.